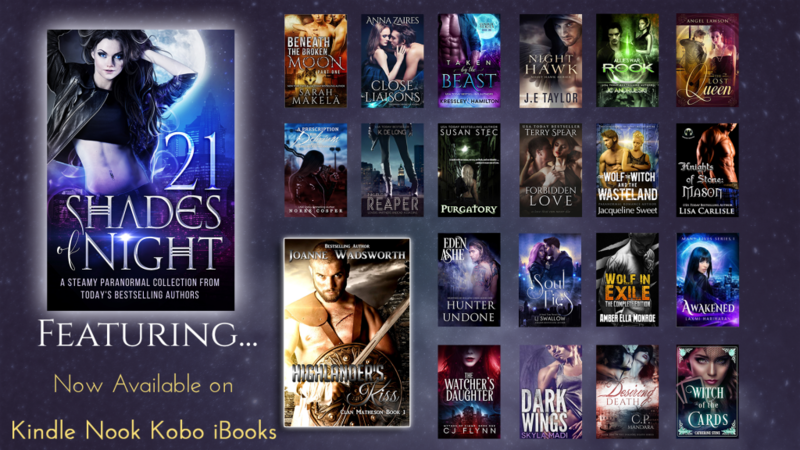 HIGHLANDER’S KISS is Joanne Wadsworth’s contribution to 21 SHADES OF NIGHT box set. For a 99 tiny pennies you can own 21 wicked novels from today’s NY Times, USA Today, and International Bestselling Authors. “And you are a charmer with your touching words.” She let go of him and walked from the bathroom, through his chamber and out his open bedroom door. The passageway, lit with bright overhead lighting led toward a stairwell at the far end. She strode along the burgundy and blue runner as Tavish jogged in beside her. “I dinnae have the right to speak of it if I do.” He was taken, and she would never come between a soul bound pair. “’Tis an anomaly for sure.” She touched his neck in return, right over his thumping pulse point.